Many gardeners welcome spring with pots of cheerful flowers. But while it's said that April showers bring May flowers, healthy plants don't bloom overnight. It takes the right combination of soil, water and fertilizer to successfully grow a container garden. So garden designer P. Allen Smith provides some spring planting tips to help gardens look their best. In 2002, consumers spent $1.4 billion on containers and the plants, soil and fertilizers that go into them. According to reports, this number is growing 20 percent a year. Even people who don't spend much time in the garden are likely to plant a pot or two for the front porch, back patio or windowsill. First things first, you need to choose a container. Smith prefers terra cotta pots or another natural material that's slightly porous. 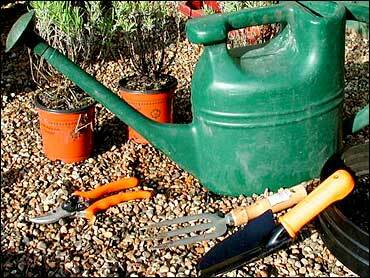 If you are re-using a container from last summer, it's important to wash it before planting. You don't want any of last year's pests or diseases returning. The easiest way to do this is to soak your pots in a mixture of water and bleach. The success of a container planting centers on keeping the flowers well watered. There are several things you can do to facilitate keeping a plant moist and promoting drainage. Before filling the container with soil, be sure to place it on a saucer. This will serve as a reservoir for the plants, allowing them to draw water up through their roots. Also, place rocks or broken terra cotta pieces on the inside bottom of the pot. This allows water to better drain out of the holes in the bottom of the container. The next important piece to the successful garden is soil. Pay a little more and buy high-quality potting soil. Smith cautions against digging up dirt from your backyard because it's too heavy, and often full of clay. You want light dirt because it will hold water longer and allow it to drain properly. And don't think you can use the soil you planted in last year. Water and wear eventually compacts the soil, reducing air space, making the soil dense and heavy, rather than light and well-aerated. Another reason to use potting soil is that it comes supplied with different materials that benefit plants, such as peat moss, ground bark and those little white particles called pearlite. However, Smith says it's still smart to add some fertilizer to your soil before planting flowers. He mixes in a handful of a slow-release fertilizer that looks like little seeds. The "seeds" will slowly feed the plant, releasing nutrients more quickly when the weather gets hotter and plants are growing faster. Smith also suggests adding "water retentative polymers" to the soil. These look like rock salt and can be purchased at any garden center. Put them in your container and they attract moisture. They grow to seven times their size and wind up looking like blobs of clear gelatine. They can be a lifesaver for thirsty plants. Finally, after you plant your flowers, Smith says you can choose to cover the soil with mulch, which will help hold water in the soil. At this point, you have taken several steps to ensure that your plant will stay as moist as possible. But you still need to water your container gardens daily, particularly if they sit on a covered porch. All of this watering will eventually wash away the fertilizer you added to the soil. Smith says that every time he waters his plants, he mixes fertilizer into the water. Look for fertilizer that's water soluable and has a lot of phosphorus to promote blooms. If you prefer an organic fertilizer, check out Smith's favorite, fish emulsion. The smelly concoction made mainly of fish matter can be applied once a week. A last note: many people enjoy planting in strawberry jars, but find that the plants toward the bottom tend to die. Once again, that's because they are not getting the water they need. Smith suggests drilling holes into a piece of PVC pipe and anchoring it in the jar with gravel or broken terra cotta. Then, water the plant through this pipe so the water soaks through all the holes, getting to all areas of the container.